Unbeatable features meet unbeatable sound in the TX-NR656, a state-of-the-art A/V workhorse that revolutionizes entertainment. Check it out: DTS:X and Dolby Atmos decoding with advanced AccuReflex phase calibration for crystal-clear object-based audio; Google Cast, Airplay, and Wi-Fi with Spotify and Tidal for music on demand. Select HDMI terminals support 4K/60 Hz/HDR/HDCP 2.2, while the 32-bit DAC extracts all the depth and detail of Hi-Res Audio. The TX-NR656 has high-current Dynamic Audio Amplification to accurately control and drive your speakers with phenomenal clarity. Whether it's pulling you deep into Middle Earth, waking the neighbors with Fallout 4, or pumping out the latest on Spotify, the TX-NR656 rekindles passion for the things you love. The Polk Audio TSi500 floorstanding Speaker is the flagship of the TSi series. With four 6.5-inch drivers, it has the power handling and bass response to sound spectacular. Pair them up with a CS20 center, TSi200's for surrounds and a PSW series subwoofer and you'll have one incredible sounding home theater system! This speaker is awesome for high impact movies and music. 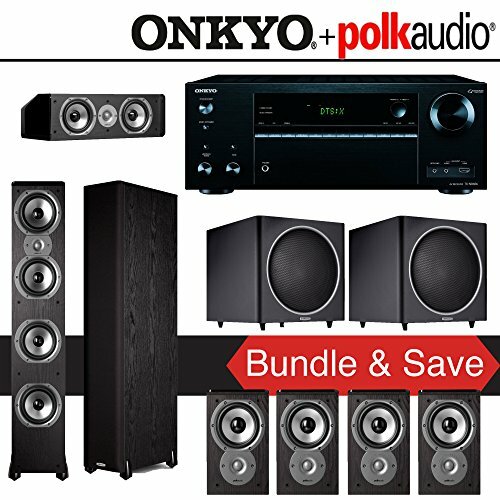 Its affordable price and small footprint means they can be used as the front channels in a home theater system or as the main speakers in a music system. For home theater, pair it up with some TSi100's or OWM3's for surrounds, CS10 center and PSW series subwoofer and you'll have a spectacular sounding system! The new TSi Series is a quality-built, affordable line of high performance loudspeakers for music and home theater. The TSi Series boasts a stylish look that complements today's flat screen technology, with wood grain finishes, piano black top plates and pewter trim rings. Built for value and sound quality, the TSi Series is a great introduction to high performance sound.